This is what citizen activism looks like. Irvine citizen-activists turn out by the hundreds, mostly to advocate for specific causes — but also to protest the elected officials who, they believe, are doing the bidding of powerful special interests while failing to represent the public interest. Irvine is “ground-zero” for a surge in citizen activism. Many hundreds of outspoken civic activists are taking action on major issues — national issues, and state issues and local issues — often directing their anger at specific elected officials and the unpopular policies they are pushing. Walters wasn’t at the Town Hall, but her record on healthcare was. 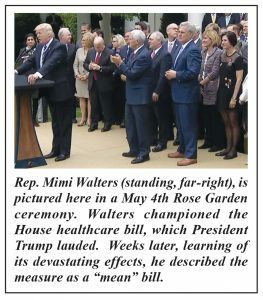 In fact, Walters was ridiculed at the Town Hall for leading the effort to “repeal and replace” the Affordable Care Act (Obamacare), which would cause more than 50,000 people to lose their health insurance in her south Orange County congressional district, including an estimated 20,000 to 30,000 Irvine residents. On June 6, 2017, Irvine activists showed up again — this time 100 – 150 of them at City Hall on less than 24-hours notice — for a “special” hurry-up meeting called by Irvine Mayor Donald Wagner, with the support of Councilmembers Christina Shea and Melissa Fox. Their purpose? To kill the previously approved 125-acre Veterans Memorial Park and Cemetery in the Great Park, so that the land could be given to developer FivePoint Communities with entitlement to build a massive, highly-profitable complex of offices, commercial/retail businesses, and thousands of residential units. This development would generate an estimated 10,000-20,000 daily auto trips, adversely affecting all of north Irvine. Meanwhile, the Veterans Cemetery would be “swapped” to an undesirable, less valuable site at the junction of the I-5 and I-405 freeways, two miles from the Great Park. The proposed FivePoint land-swap scheme appears to be motivating many hundreds of citizens — especially in north Irvine — to get involved with the Veterans Cemetery issue, signing the Veterans Cemetery Petition, and speaking out whenever possible. Many have vowed to show up at City Council meetings in August, September, and into the fall, addressing not just the Veterans Cemetery issue, but also the larger issue of uncontrolled growth and development that seems to be provoking anger in every corner of the City. 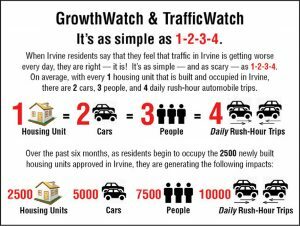 The first six months of 2017 may have been a period of the fastest residential growth in the City’s history, with as many as 2,500 newly-built housing units occupied, producing an astonishing, additional 10,000 average daily rush-hour trips in Irvine, according to the “1-2-3-4” analysis developed by ICNV. 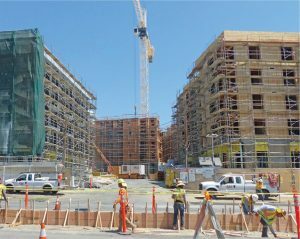 These apartments in south Irvine are among the thousands of units being built in 2017 and 2018. Asked about Mayor Donald Wagner’s initiative to re-establish Irvine’s Transportation Commission and hire a “traffic czar” to come up with solutions to Irvine’s traffic nightmare, the consultant laughed. “Way too little. Way too late. It’s like trying to stop King Kong with a pea shooter,” he said. 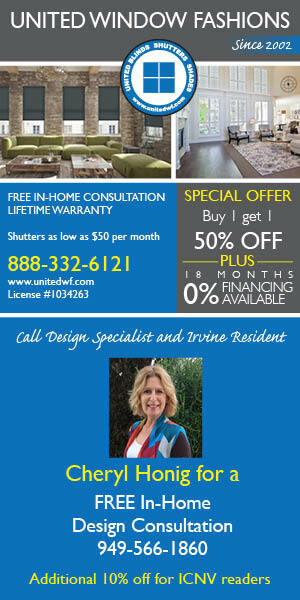 PreviousGlobal Warming in Irvine: Now, It’s Personal! NextMore Than 1,000 Have Signed the Great Park Veterans Cemetery Petition. 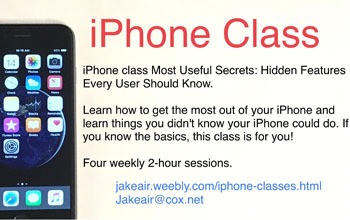 Add Your Name and Comments Now!